After dinner at Stand, TL and I met with LB and JL for a post-burger dessert. 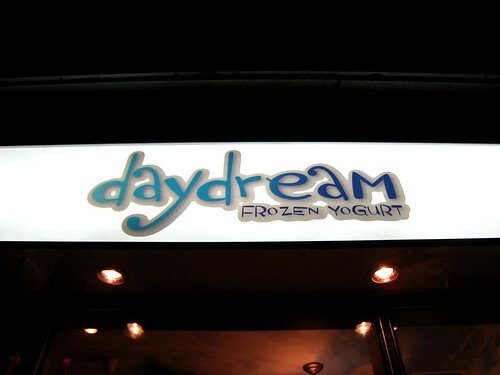 They took us to Daydream, a frozen yogurt joint they had discovered recently and enjoyed. The shop has a pretty different look than the Pinkberry/Red Mango-type places. 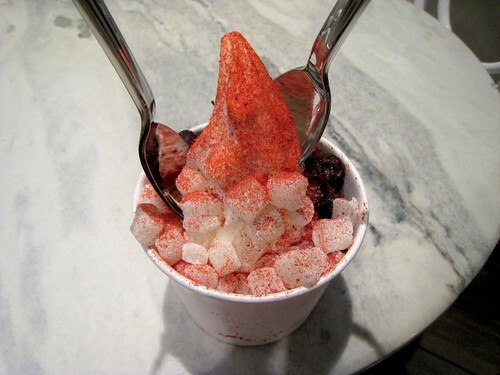 Aside from the option for "creamy" or "icy" frozen yogurt, Daydream's array of fruit dust toppings is the most obvious thing that sets the place apart. TL and I split a medium-sized, plain-flavored, icy frozen yogurt and asked for our usual toppings of mochi and blueberries along with a shake of strawberry dust. I regret to say that the dust didn't really do much for the experience—the flavor just didn't register—but the yogurt/mochi/blueberry combo was as good as any I'd had elsewhere. I'm not too fussy about my frozen yogurt: Red Mango has a slight edge on Pinkberry for me, but really I like them all. Can someone please open one of these places in Fort Collins?